Welcome to the New Moon! This will be our last fire indoors before we move the energy outside for Equinox and beyond. 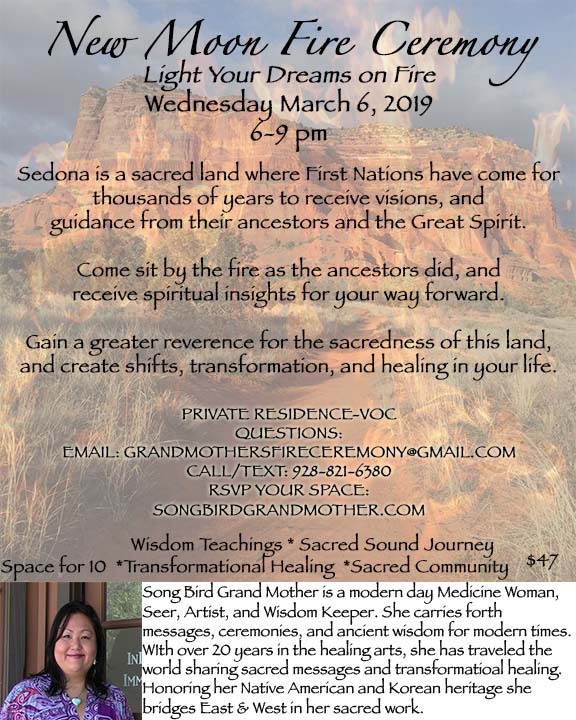 Come and join us for a sacred gathering where we will go deeper into the ancient teachings of The First Nations and ancestors who walked these sacred lands before us. Understand the significance and truth of these sacred lands, and journey into your soul to receive guidance, wisdom, and truth from within. We will spend this sacred time together focusing on our visions, prayers, and guidance for the way forward. For this fire, we will enhance the power of the fire with a drumming and sound journey using sacred songs and sounds to open your visions. Address is given when your ticket is confirmed. It will arrive by email, so please look for it.